JGiven is a developer-friendly and pragmatic BDD tool for Java. Developers write scenarios in plain Java using a fluent, domain-specific API, JGiven generates reports that are readable by domain experts. Further examples can be found in the jgiven-examples module of JGiven. The source code of the corresponding JGiven tests are in the jgiven-tests module of the JGiven project. Jan Schäfer gave a Tools in Action session at Devoxx Belgium 2016. 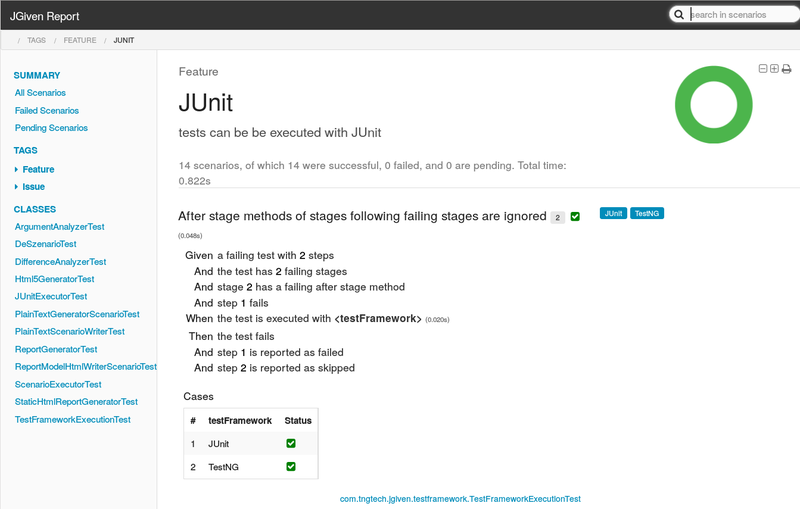 It mainly consists of a live demo showing how to refactor an existing JUnit test to use JGiven. Marie-Laure Thuret (@mlthuret) and Clément Héliou (@c_heliou) did a live coding session with JGiven at Devoxx France 2016. Jan Schäfer gave a talk on JGiven at the BigTechday 8. It explains the rationale behind JGiven and gives an introduction into the main features of JGiven.